The desert is a place to reflect. It is an extremely harsh and desolate place. There seems to be nothing more than sand, dunes and the sound of wind. The beauty however lies in how nature constantly shapes the landscape. The desert is constantly evloving and it has so over thousands of years. What we see today as desolate and unihabitable was once a lush green plain with vast inland lakes and rivers, teeming with life, has become a dustbowl of sheer unimaginable size. 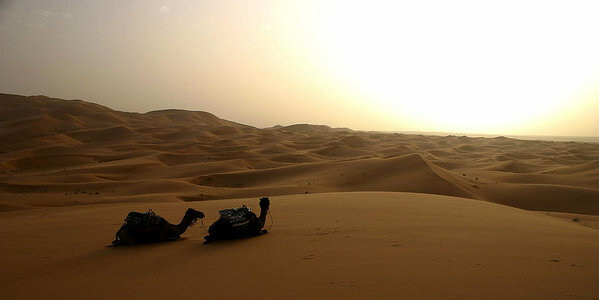 A third of the African continent is now the Sahara desert. Looking closely it becomes very obvious that there is much more to be appreciated. Just by sitting on a sand dune and looking into the distance at sunset lets one forget about the hustle of a busy city and absorb the beauty of a landscape that is being shaped by wind every day. Sand dunes are being shaped and shifted slowly. Some disppear others slowly emerge. A continuous natural process. This image was taken at sunset in the Erg Chebbi desert at the edge of the Great Sahara Desert in Southern Morocco. Two Camels at Sunset. An award winning image. The actual image size is 60cm x 30cm plus a 5cm white border, which includes the limited edition number on the left and the artists signature on the right. Please note: Frames are not inclusive. Prints are individually made to order and therefore 5-7 days for dispatch are required. Free shipping within Australia and flat packed to preserve the integrity of this exclusive print. For overseas shipping please contact the artist. Each print is numbered & signed by the artist. The print is registered with the National Registry of Australian Art & Artists (NRAAA) with the number NRN: 00040207-0138-01. It comes with a registered, numbered and hologrammed COA, which corresponds with the number of the hologram on the back of your print and is also signed by the artist.